Naughty me, it’s been ages since I’ve blogged… My SL bunny rabbits are taking up all my time! And for all my fellow Ozimals bunny addicts, here’s something really cute I got the other day… the Bunnymoon Suite, an adorable little set of accessories to pose your bunnies with. As you can see, the Bunnymoon Suite comes with a cute little bed for your bunnies to curl up on, a hot tub for them to relax in, a table with wine, a shower, and an animated sitting pose so you can pet the bunnies on their bed. I was impressed with the high quality of the build and textures – the bed even comes with four choices of colours, themed to the seasons and accessible via a scripted menu. To be honest, my bunnies take up so many of my prims that I don’t put a lot of accessories out on my breeding patch, as it’s up in the air where no one sees it. 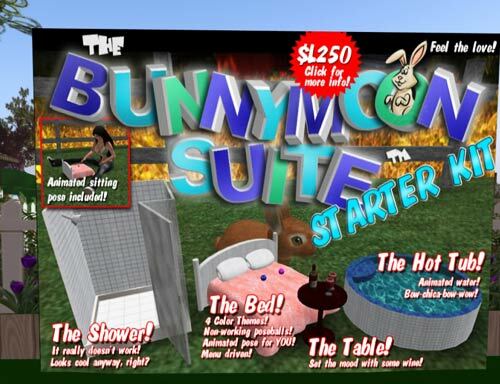 But the Bunnymoon Suite is so irresistible I just had to use it, so the bunnies in my baby sale pen are now sitting comfortably on their bed, and chilling out in the hot tub. 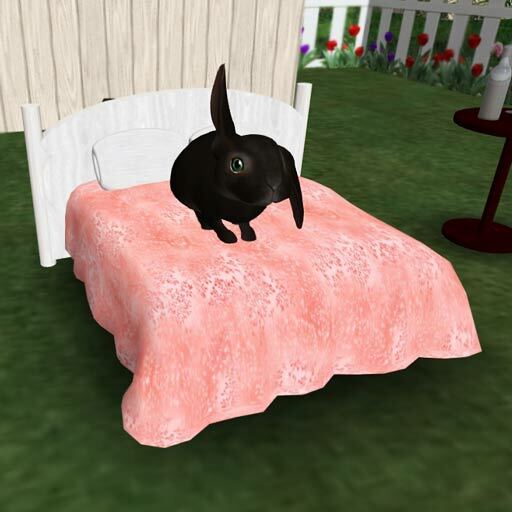 You can get the Bunnymoon Suite on xstreetsl, or come and see it inworld and buy it from the vendor at Green Acres Bunny Market. And on the topic of Ozimals bunnies, Green Acres Bunny Market now has a bunny newbie help and info center. New to breedable bunnies, and want FAQ notecards covering the basic points of how to pick your new bunny, how to breed them, which furs are the more rare, and what price you can expect to sell them for? Come and get ’em! I do a lot of hosting for live music in Second Life, and last night got paid a really great compliment by the singer’s manager. She said “Thank you Sapphire for being an AWESOME host, you totally made this an awesome experience”. The way that made me feel proves that compliments really are even better than lindens! So I thought I’d write a bit about hosting in SL – what the job entails, and how to be good at it. Or at least, how I do it! Exactly what a host does depends on the venue. I send notices to two groups before the event, and group IMs to them when the even starts and 15 minutes in. At some venues I’m in charge of doing the event listing on the SL website, putting the artist’s stream in, and turning rezzing on and off so they can rezz their tip jars and fan boards. After that, the main job of the host is greeting people by name as they arrive, and making them feel welcome. Tell them things like where the dance balls are, or invite them to grab a seat and get comfy, and if they’re newbies sometimes offer help like how to use a dance ball, or make sure their sound is on! It also involves reminding people to tip the artist and venue – often enough to get the tips flowing, but not so often as to be annoying. You might also tell them how to get a songlist and make requests, join the artist’s fangroup or the venue group, and let them know what other events are coming up as the event you’re hosting nears its end. It’s pretty similar for a club event, except there you’re encouraging tips to the DJ, and might also be telling people how to join a contest or something like that. Whatever the event, the most important things are being friendly, and responding to the crowd. If people don’t want to chat, there’s no point trying to force it, but you can still encourage some interaction by saying when something’s one of your favourite songs, or complimenting someone on their outfit, or whatever. If the chat is flowing fast and free, join in! And match the mood of the audience in tone. Thanks everyone for coming to VENUE this evening to hear PERFORMER. And thanks for supporting live music on Second Life by tipping him/her generously in his/her tip jar by the stage! I hope you’ve all been enjoying PERFORMER as much as I have today. Please don’t forget to show their tip jar some linden loving! At some point I generally throw in and of course the venue and I appreciate your tipping generosity too. And that’s about it. It’s more work than it sounds, especially if a lot of people are arriving and you’ve got major lag, but it can be a lot of fun (and you can make some decent tips from it!). All it really takes to do it well is to be friendly, welcoming, and interact with the performer or DJ and the crowd. 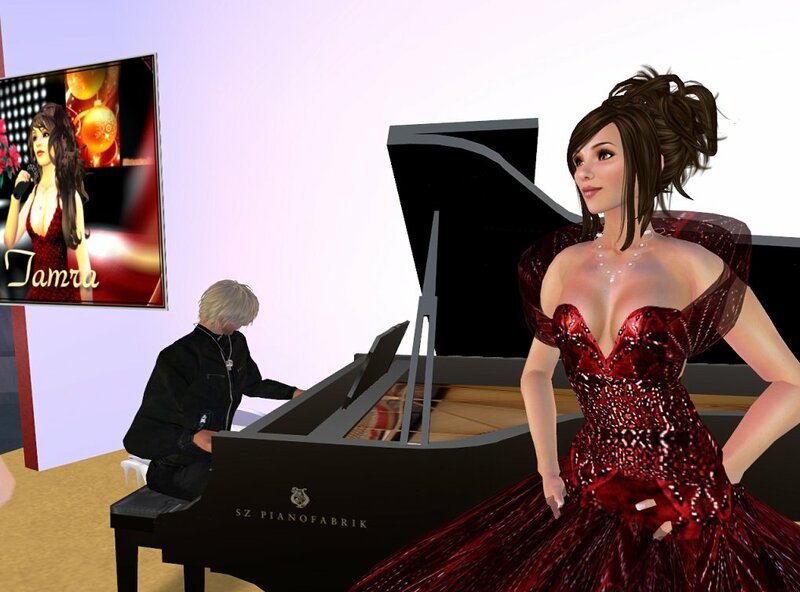 The music scene is on Second Life is bursting with activity, with a huge range of clubs and live music events on offer every day, some of them offering themed contests to draw in the crowds. Some performers pull in big fees, others do it just for the love and the tips. As one of my regular SL jobs is hosting these kind of events, I’ve grown curious about how people relate to money in Second Life, and what they consider a good tip. And a brief look around the SL blogs hasn’t found me any guides to “tipping etiquette”, so I thought I’d look at the issue a little here. When I asked about this on Twitter, the average tipping amount seemed to be L$50 to L$100 with people repeating the tip for a song they really loved, or a particularly great performance (although most people replying were talking about DJs, rather than live performers). This is pretty much my standard tip too – but I also like to tip the host, and often throw in a bit to the venue, so my tips will often add up to maybe L$250 over a couple of hours. That’s roughly a dollar. Now to me, L250 feels like a reasonably generous amount to spread around, but to someone who makes a good part of their living on SL (and yes, they exist! ), that probably feels like almost nothing. If you’d give a dollar to a busker, why wouldn’t you give that to a live performer who you spend an hour enjoying in SL? It’s hard to find an answer to that one, although of course most people seem to walk past buskers without even throwing them a quarter so I’m not sure the argument really holds! But most of us also just don’t consider spending lindens the exact equivalent of spending real money. If clothes and rent cost us what they cost in real life, no one would be on SL. And of course there are newbies who may be discovering SL music for the first time, and might have camped for a few hours just to get L$10. To them, that makes it a massive tip. I once got a $L1 tip from a newbie who said sorry, but that was 10% of what they had. To me that was great, because it meant they’d learned to tip hosts! Since Solace Beach has the Solace Cove newbie orientation area, we get a lot of newbies, and hence our DJs and hosts get paid a basic rate because we know people coming to parties and trying to win $L100 contests aren’t going to have a lot of lindens to tip with. At live music events I find tips vary enormously. Some performers seem to attract crowds who tip frequently and generously, with others I get very little as a host, and the performers make around $L1000 in tips over the hour. I also notice a wide range of tipping behaviour from the performance themselves towards hosts. Some remind the audience to tip the venue and/or host, some tip me 200L or so at the end of the show, one manager even regularly tips me 500L! I’ve noticed a few searches from people trying to find information on how to breed bunnies in second life, so here’s what you need to know! What do I need for my Ozimals bunny to breed? You need a male and a female bunny, aged 4 or older. They must be eating level 2 food or above, and not in cooldown (which they go into after having a baby, or after being switched from level 1 to level 2 or above food). Then, they have to have the right stats: they must be at 100% love, have 75% happiness or above, and 25% or higher energy. They must also be within range of each other. If your virtual bunnies fulfill these requirements and aren’t producing a nest, it helps to bond them (under the interaction menu). You don’t need to own both rabbits, you can bond yours to a friend’s, so long as they accept the bond request. They must also be awake, on the ground (not held), and there must be at least 1 other prim on the parcel. And they must have at least 1 generation left. You can get certain boosters from the Ozimals store to help your bunnies get these stats – the Happy Stump increases happiness for bunnies in its range, and the red bunneh drink increases energy. There are others, but these are the ones I find most helpful. Check the manual for full info! What about Ozimals bunnies pricing? How much you can sell your nests or babies for depends on many factors – the market varies from day to day, and a bunny that’s worth 8000L one week can be worth 2500L the next. In general, the more recessive the trait, the more desirable the bunny. A pure white Holland lop with lop ears and gem eyes can still get you 8k. Chinchilla, lynx, castor, opal, fawn, and black otters are also desirable, particularly if they’re radiant or silky, or have other uncommon features. Classic lops are currently going for around 1000 – 1600L. At the other end of the market, a plain classic nest goes for between 150L and 300L, and you can find classic adults with 7 or 8 breeding generations left for about 200L. Another factor influencing the market is fur retirements. Ozimals have just retired the Black Havana and Chocolate Mini Rex furs, meaning they will no longer be available in bunnies bought direct from Ozimals. This means they can only be bought from a breeder, making prices go up. By the time you read this, these prices may be totally inaccurate. Really the only way to judge how to price your nests and rabbits is to have a look around the markets, and at group notices, and see what other people are asking. I recommend the Bunny Ranchers and Bunny Advertising Network groups – you can look through past notices to see what’s available right now. Also, the official Ozimals community forums. And these are also where you want to go to post your ads, so people know what you’ve got for sale. And come on over to Sapphire’s Bunny Farm to take a look at my nests and bunnies for sale! The one thing my Second Life has lacked is a decent pet – I love dogs, so I’ve been holding out for someone to make a really good Irish or English Setter. So when I saw a couple of Ozimals bunnies at a friend’s, I had to get a pair – Wes and Winifred, brownie points to anyone who knows who they were named after! Then another friend gave me her 3 bunnies, and I realized if I was going to have baby bunnies I’d need more prims, so off I went to rent a bigger plot. Now I’m a little afraid to count my bunnies, because yes, they can breed, and they’re positively addictive. So I started a Bunny Farm, to start selling some of them off. Ozimals bunnies are my new favourite toy. They have dominant and recessive genes passed on from the parents, so you don’t know exactly what kind of baby you’re going to get, though the more you breed a pair the more idea you get what they’re likely to produce. They come in all sorts of furs, coats, colours, and eye colours, and three kinds of ears. You can turn animations down to save on lag if you have a lot (like me! ), or just let them hop around with ears flopping as they go. They don’t need pens or hutches, but they do need food and water (which starts at 99L for one non-breeding pet bunny for a month). And they do eventually die – which is a great reason to get two and breed! It’s a brand new market so prices are fluctuating all over the place right now. You can get a classic bunny for around 300L, but the really special ones (radiant, lop eared, gem eyed, or in greatly desired colours like all white) can go for thousands. And no, they don’t quite breed like bunnies – you have a few days to wait in between breeding time, and they produce one bunny nest at a time. But most of all, they’re cute. I never got the whole Sion chickens thing, but Ozimals bunnies are completely darling. They even dream. If you want to see the bunnies, or learn more about them, come on over to Sapphire’s Bunny Farm, where you’ll get a FAQ notecard which should answer your questions. Also feel free to IM me for any more info! And if you want a bunny and let me know you’ve come via Twitter or my blog, I’ll be sure to give you a good price. You can also get all the information you need from the official Ozimals Bunny Manual. I’ve also got to give Ozimals major kudos for their terrific customer support. The official Ozimals Orations and Updates group is full of friendly and helpful people, and when SL was borking last week and one of my bunny nests (which new baby bunnies are born from) vanished, I filed a support ticket with Ozimals and they responded and replaced the missing nest within 10 minutes! I’ve been meaning to write this entry for a couple of weeks now, but one of my periodic cycling depressions has struck, and in this mood it’s hard to find the words for what I want to say. So I’ll jump straight to the first point, and refer you to Emily Orr’s blog entry, in which she reacted to my previous post and the Virtual Hallucinations Project. I still think the project is extremely valuable for giving people a glimpse into hallucinations and particularly schizophrenia, but found reading Emily’s perspective eye opening. She also writes about her visit to the Survivors of Suicide project. The immersive part of the project begins with a warning: This part of the Survivors of Suicide may be disturbing. Oddly, or maybe not, I didn’t find the Survivors of Suicide Project disturbing – moving, important, saddening, but not disturbing. I suspect this is for reasons similar to why Emily wasn’t disturbed by the virtual hallucinations project – feeling suicidal is something I’ve lived with for more than half my life. Not constantly, but constantly enough during my teenage years and often enough during my adult life that, I suppose, it just can’t shock me. The only thing I felt the project didn’t achieve was any taste of the experience of feeling suicidally depressed, and really I’m not sure how anything possibly could. If you’re not in that state of mind, it’s almost impossible to even accurately remember how horrific it is – why would you want to, anyway? It’s a place of empty, pitch black hopelessness, falling through an endless tunnel of horror where you’ve lost the will even to try to grab at the illusion of a ledge. All you can think about is the desire for it to end – to hit the bottom and die, so finally it will all be over. The main thing that’s kept me alive is that when I’m in that state, I can barely move, let alone gather the energy to carry through any kind of suicide plan that carries the slightest chance of success. 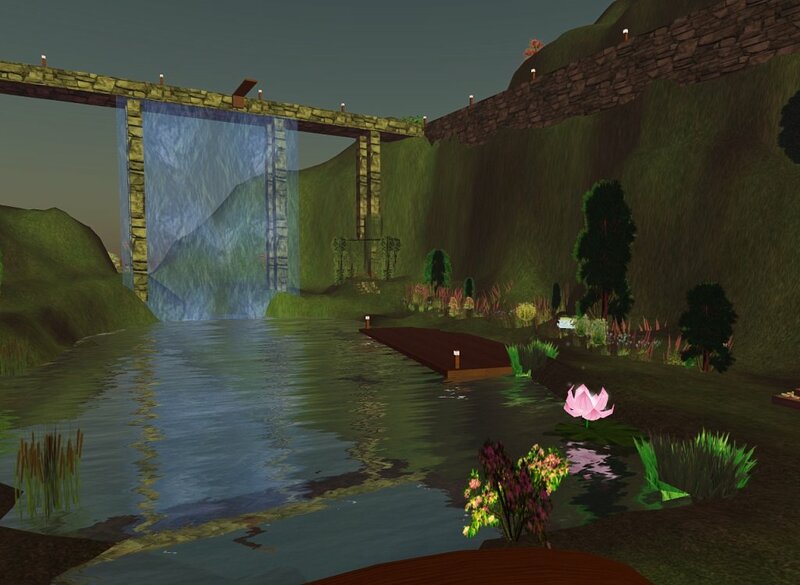 If you are feeling depressed, Second Life has a Support for Healing island that offers group support discussion sessions in an attractive environment. The depression support chat is at 4 pm slt, which is too late for people in Europe unless they’re a serious night owl (or too miserable to sleep), but there are also anxiety support meanings timed for people in the UK. I’ve occasionally seen news reports on whether “too much” internet use can make people more depressed (a stupid question, as “too much” inherently means “to a degree that’s bad for you”, duh). There seems to be an assumption in many of these that if all the miserable depressed internet users would only get off their computers and do something in real life, we’d transform into shiny happy people. At the end of the piece a line may be thrown in pointing out that some people actually get useful support from the internet. I’m definitely one of those people. The first meaningful support for depression I had was on usenet, when I first got online in the 90s. Until then I didn’t realize it was something I could even talk to a doctor about. But with things like Second Life, I think the usefulness extends beyond support groups, because it provides an environment for interaction with others than I can manage far better than I can cope with real life. It might be “good for me” to leave my computer screen more often, but it’s also immensely difficult and exhausting for me to deal with the real world, much of the time. No, hanging out with friends in their homes on SL isn’t really as good as hanging out with them in real life, but since my friends live around the world and even the ones in my country are far enough away that I don’t see most of them very often, SL is fricking awesome. What’s more, there are certain things that tend to make most people feel a bit better about themselves – namely, a sense of community, and feeling you can contribute and do something useful. It can be tough to find these in real life if you’re socially isolated (whether it be by temperament, illness, or geography), and especially if you can’t function in the work environments available to you. If you can’t work at all and have to live on disability benefits you have the added joy of being made to feel like a social pariah, even when you do voluntary work. On Second Life, I very much feel part of a community. My friend Ayesha Lytton runs the land of Solace Beach, which includes a newbie orientation area, an underwater treasure hunt that I helped build, shopping, an amusement park with a drive in movie theatre, and regular live music and DJ events, as well as having over 60 sims of rental land. Sometimes I potter around helping out newbies; sometimes I make clothes and accessories to put in the treasure hunt or sell; sometimes I host at events, or just help out in whatever random ways are useful at the time. Hosting is something I’d loathe and be terrible at in real life, but on Second Life it’s ideal. Two hours work a week pays my SL rent, my managers are my friends, and we have a friendly crowd of regulars who let us know they really enjoy themselves with us. It’s also a world that’s full of creativity, with magical places to explore. The work and the love that people put into their Second Life creations is inspiring and uplifting, as is the work people do on educational projects and support islands. This stands in stark contrast to how I tend to feel when I venture out into the real world for too long at a time! When I first visited the Virtual Hallucinations Project on Sedig, after reading the New World Notes blog entry about it, I didn’t think I was likely to find it nearly as disturbing as the article described. I’ve read numerous books about schizophrenia, have friends who suffer from it, had conversations with people who were convinced the birds were spying on them or people were hypnotizing them into making their leg hurt, or their girlfriend was actually someone else who’d had a face transplant… An educational tool on Second Life to give people an insight into the experience of schizophrenia sounded like an extremely important and worthwhile idea, but I was skeptical that it would get to me in the way it obviously got to some other people. After all, it was only a couple of minutes long. The project was created by a doctor in California as a training tool. You put on a button which loads the sounds, and put on headphones so the noises are right there in your ear, as if they’re inside your head. 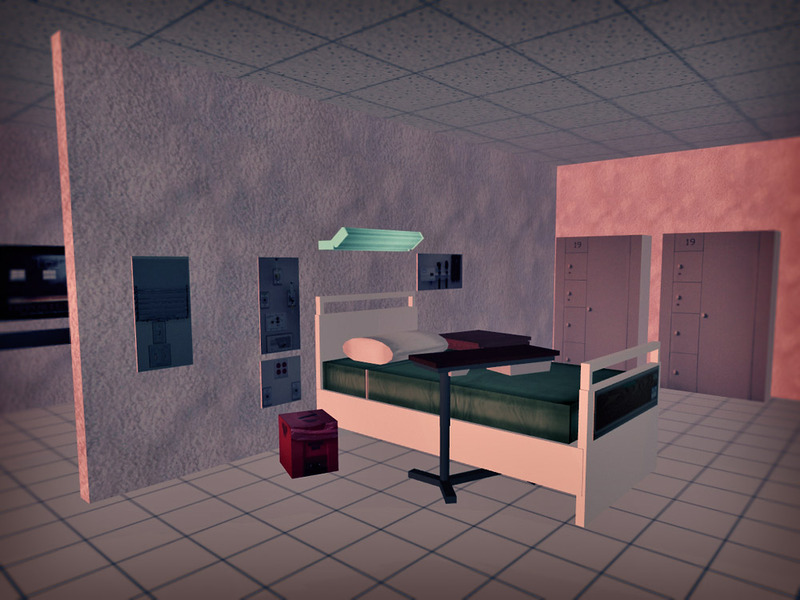 Then you enter a small building that replicates areas of a psychiatric hospital… and the voices and visual changes start. 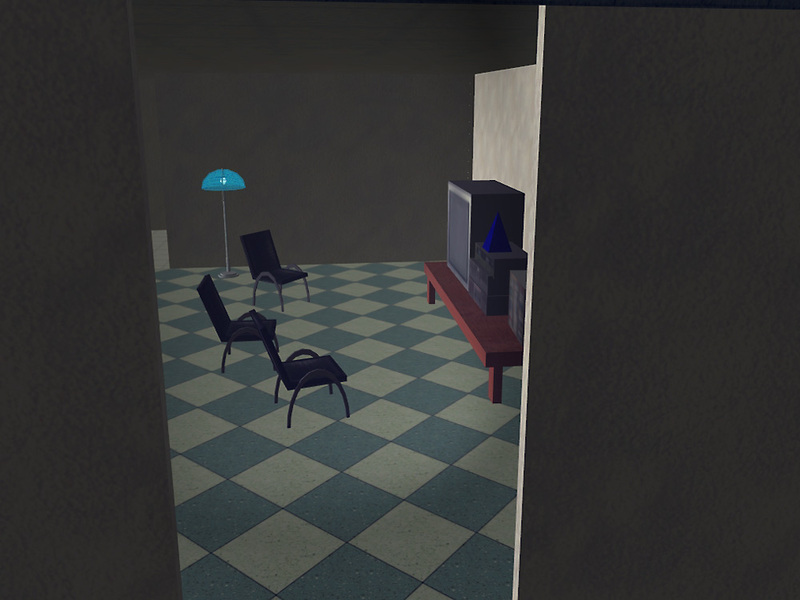 The voices and graphics recreate experiences related by specific psychiatric patients – a man who saw himself dead in the mirror each morning, another who heard voices telling him to take a police officer’s gun and kill himself – as well as common themes, like a television broadcast which talks directly to you. Simply knowing about these things does not prepare you for the experience of hearing the voices as if they’re there in your head, repeatedly telling you how worthless you are. After a couple of minutes I emerged the other end, and burst into tears. I TPed a friend over and told her to go through – she came out the other end with exactly the same reaction. The idea of living with this every day, every minute, with no off button, no escape, is simply horrifying. I wish everyone who works in the field of mental health would be taken through the Virtual Hallucinations project – in my experience, it’s shocking how many of them lack any empathy for their patients (or service users, as people in the system are now called). And given the terrible amount of stigma that still surrounds mental illness, particularly of the more severe kinds, I think it’s somewhere many people ought to visit. The Project warns that it is not a good idea to go through it if you’ve experienced psychosis, however, and I wouldn’t recommend it to anyone who’s currently very depressed or battling intrusive negative thoughts of any kind. It really is horrendously disturbing. But it’s also a tremendously important educational project, so if you’re not mentally unwell yourself, and have the slightest interest in developing your knowledge or compassion towards others, go there now.